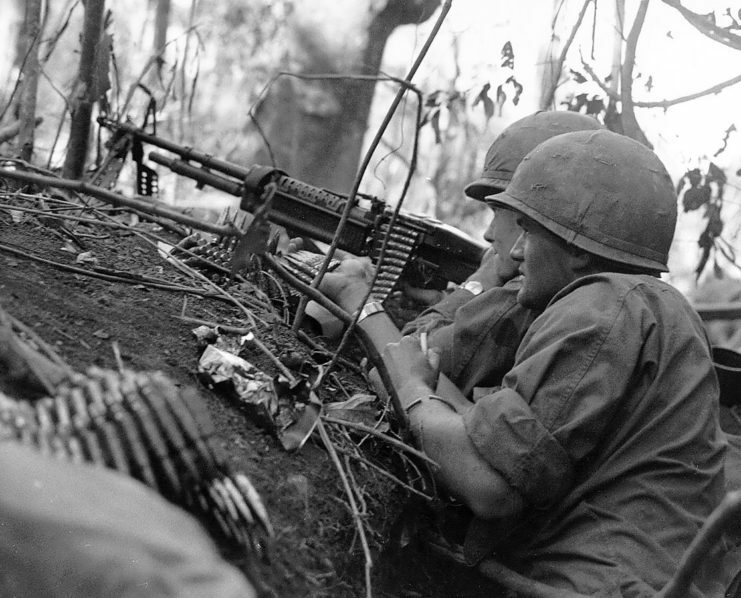 During the Cold War, the rise of the assault rifle put automatic fire in the hands of ordinary infantry. However, machine-guns continued to play a part as heavier support weapons. Produced by the Fabrique Nationale (FN) at Herstal in Belgium, the Mitrailleuse d’Appui General (MAG) was one of the more popular machine-guns of the 20th century. It was unremarkable in many of its features but was produced to a high standard that made it reliable. Its most significant innovation was a variable gas-regulator used to control the amount of propellant gas siphoned off from the barrel to power the mechanism. It allowed operators to vary the rate of fire and increase the amount of gas to overcome problems with fouled barrels. The MAG’s biggest downside was its 50-round belt. It was suitable for sustained fire but could get in the way of machine-gunners trying to advance quickly in a support role. The MAG was widely exported and produced under license in countries as diverse as Argentina, Israel, and South Africa. Like many other nations, the British adapted the design of the MAG to suit their purposes resulting in the L7 series of guns. A powerful sustained fire weapon, it used boxes of metal-linked ammunition instead of a belt to get around the problem of the ammunition feed. The MAG’s only real competitor for popularity in the West was the American M60. The M60 went through a very drawn-out design process. It began during WWII when American designers looked at German guns. They took superior elements from those weapons, such as the Maschinengewehr 42’s ammunition feed and the Fallschirmjäger 42’s piston and bolt, and combined them with American elements. By the time they had finished designing and testing the war was over. The M60 did not reach American units until the 1950s. 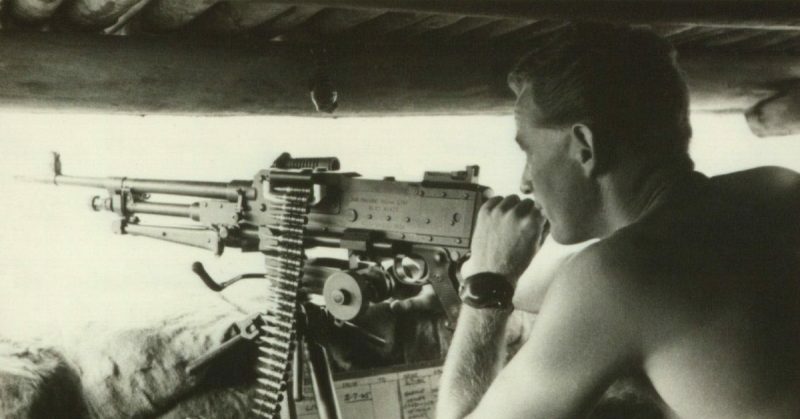 The M60 was unpopular with troops, due to failings such as the awkward barrel changing system. It was hastily redesigned but remained unpopular because of its poor balance. Despite the flaws, the M60 saw widespread use in the US armed forces and with their allies; in particular the Australian, South Korean, and Taiwanese armies. M60 in 1966, during the Vietnam War. Aside from the USSR, Czechoslovakia was the largest arms manufacturer in the Warsaw Pact. The vz59 was the Czech contribution to the machine-gun arsenals of the Cold War. A successor to the pre-war vz26 and the more complicated vz52, the vz59 had similar workings to those earlier models. Variants existed for use as a light machine-gun or a heavier tripod-mounted version. A version also existed that could fire the NATO-standard 7.62mm round, increasing the gun’s international export potential. First appearing in 1946, the PK was the Soviet Union’s primary general-purpose machine-gun. Like all Soviet weapons, it was designed to be simple yet effective; an idiot-proof weapon widely distributed among conscript soldiers. Like many Soviet automatic weapons, its bore was chrome-plated to reduce the wear that came from sustained fire. Using ammunition belts that held up to 250 rounds and with a cycle rate of around 700 rounds per minute, the PK could put plenty of lead into the air. Adaptations were made for various purposes including anti-aircraft fire, squad support, and export to China. The RPK was a specialized Soviet light machine-gun that first appeared in 1966. Derived from the AKM assault rifle, it was designed for use as squad support. The RPK had a top cycle rate of 660 rounds per minute. However, with ammunition drums holding a maximum of 75 rounds and a barrel that could not be changed when worn out, firing at that rate created problems. Soldiers were encouraged to use it at a lower 80 rounds per minute. The RPK was widely distributed. It was adapted for changes to Soviet ammunition and also production in China. As the face of battle changed, so did the weapons used by the opposing forces of the Cold War. The growing prominence of the assault rifle, coupled with an expectation that most shooting would happen at relatively close range, led to a shift to smaller ammunition. It gave soldiers more shots at the cost of reduced range stopping power. One response was the Minimi, another FN product. It was a light machine-gun designed to fire the NATO-standard SS109 5.56mm round. Many of the Minimi’s features were adapted from the MAG, although others were new. A bolt system moving on twin rails inside the receiver ensured smooth, vibration-free movement, leading to greater reliability and accuracy. 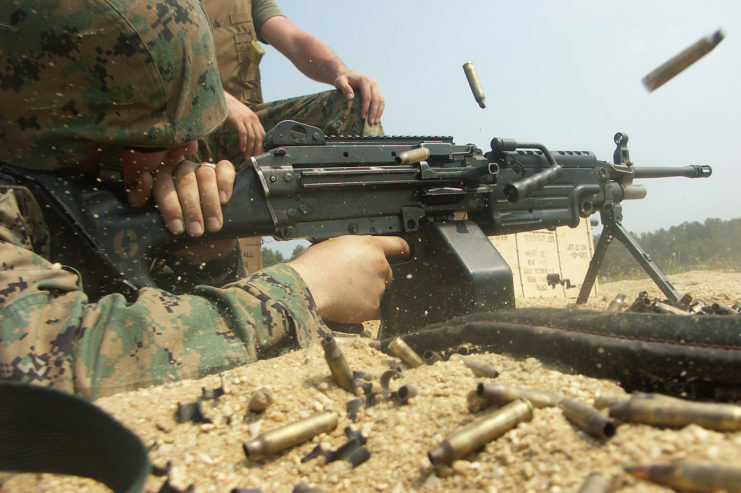 A U.S. Marine fires the PIP-upgraded M249 SAW, an adopted version of the Minimi. The forces of east and west focused on weapons for use if the Cold War went hot. Designers in Brazil had a different agenda; profit. They created a weapon for export without the economic and political baggage associated with Soviet and NATO technology. The Uirapuru Mekanika was a fairly ordinary and relatively heavy weapon whose main advantage was its modest price tag. While the great powers stood in an uneasy stand-off, small wars proliferated in Asia and Africa. Some were proxy conflicts between NATO and the Warsaw Pact, others purely local conflicts. All of them created a market for light machine-guns. One of the companies supplying the market was Chartered Industries of Singapore. Their Ultimax 100 might sound as if it was named by a small child trying to sound impressive, but it was a light, and effective machine-gun designed for the widely available US M193 5.56mm round. 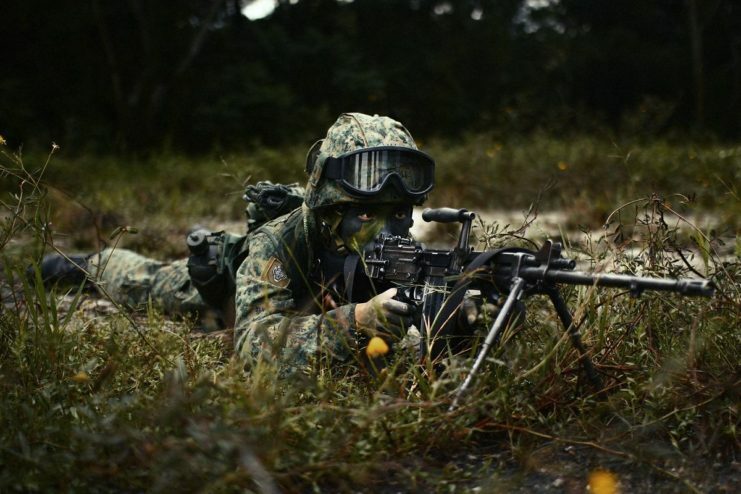 A Singaporean soldier with a deployed Ultimax 100 Mk 2 Section Assault Weapon (SAW). Photo: plaits / CC BY 2.0. The L86 Light Support Weapon was the British attempt to tap into the same market. Originally intended to hold the British 4.85mm round, it was changed to take the NATO SS109 5.56mm round, as standardization became increasingly important in the marketing of weapons.